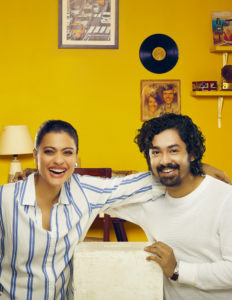 Helicopter Eela is an entertaining slice-of-life film, starring Kajol and Riddhi Sen in lead roles that will resonate with families across the world. Produced by Ajay Devgn and Jayantilal Gada, the film is quite a realistic approach to the relationship of a mother with her children. Helicopter Eela showcases a mother’s endearment and sacrifices for her little ones, and how kids respond to these emotions at different stages of their life. What will appeal to the audience most about the film is the simplicity of the message in it. The trailer that came out earlier this week shows us a small glimpse of this amusing vis a vis that parents and children share on a daily basis. It’s hilarious that we all relate to our moms asking us, ‘dabba leke aaya?’ or the many times, our moms have stopped us from talking to strangers or eating odd junk food. We all long for our mom’s love and care but her public display of affection surely gets us all embarrassed and even annoyed sometimes. Eela’s question to her son, ‘Who do you love more – your mother or your phone?’ or ‘Do I embarrass you in front of your friends?’ will definitely leave us nostalgic about our own mothers. The essence of Helicopter Eela is in the countless banter that moms get into with her children, her constant plea to her kids to spend some time with her, the never-ending embarrassment, being annoyed at, and arguments full of smiles, laughter, and tears, and the sentiments that a mother-child share in between them. With so much to look forward to, we cannot keep with the wait!